Many people with posttraumatic stress disorder (PTSD) have a fear of speaking in public. This is a form of social anxiety. These fears can have a tremendous impact on a person's level of success at work or at school. Someone with a fear of public speaking may avoid jobs, classes or situations where they have to present in front of other people. But you can overcome these fears, even if you are also dealing with PTSD. People who fear public speaking often beat themselves up over these fears. However, if you fear public speaking, it's important to remember that these fears make sense. When you're speaking in front of a crowd, you're vulnerable. This can be very frightening for someone with PTSD. In addition, you may be afraid that people will evaluate you negatively. You may even fear a positive evaluation because if people think you did a good job, they might expect that you'll always perform at that level. You fear that a new standard has been set that will be difficult to keep up. Fortunately, you can learn to overcome your fears. 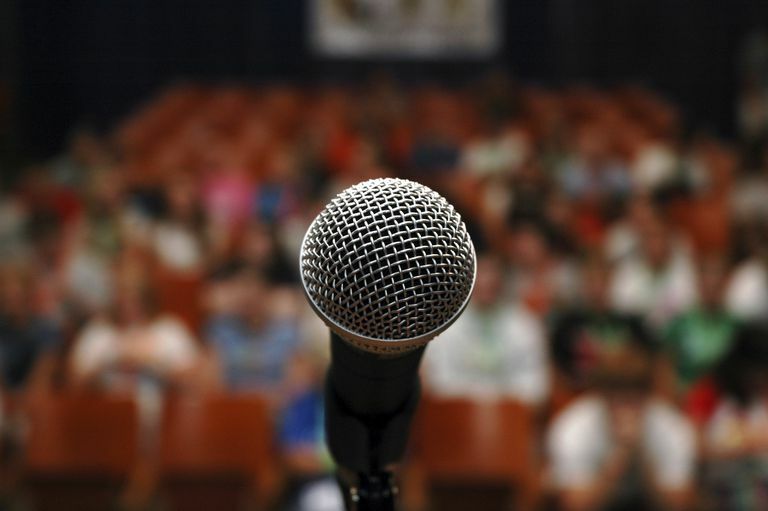 Here are some tips for people dealing with PTSD and fears of public speaking. This advice can help you better manage your anxiety over public speaking, as well as improve your confidence when you are speaking in front of others. Recognize and validate your anxiety. Anxiety is normal when people engage in public speaking. Accepting the anxiety and being willing to experience it will prevent it from growing and potentially interfering with your presentation. “Willing” yourself to relax or trying to push the anxiety down will only distract you and increase your anxious arousal. Remember, no one in the audience knows how you're feeling on the inside. Breathe. Before you begin talking, take some time to focus your attention on your breathing. This can reduce your anxiety and keep you focused before you present. Release muscle tension. Don’t clench your fists or lock your knees. Use hand gestures. If you notice that you're tensing up, move around. Movement also helps with breathing. Focus on your message, not your body. When people are speaking in public, they often focus on their internal sensations or whether they're blushing, shaking, etc. When we're speaking in public, small body movements or small changes in our body are intensified. What might feel like a great amount of trembling or shaking to us is likely unnoticeable or minor to our audience. The more we focus on these experiences, the stronger they will get and the more our anxiety will interfere with our message. Practice. Obviously, practice is important when giving a speech. However, people often practice in the wrong way. People often practice speeches by going through exactly what they want to say, almost to the point of memorizing the presentation. This is setting you up to fail. During the speech, if you deviate from what you practiced or memorized, you might become derailed, causing your anxiety to spike. Practice going through concepts, not words. Become familiar with the main points you want the audience to take home. These main points can be delivered in a number of different ways. Have water available. This can help with dry mouth, but it also gives you an opportunity to take a breath if you need to during your speech. Avoid caffeine or sugary liquids. Plan breaks in your presentation. Ask if anyone has any questions. Even if no one has any questions, this gives you the opportunity to breathe and collect your thoughts. You can also direct questions to people in the audience as a way of giving yourself a break. Try to avoid using notes. When there is too much on a note card, people often rely too heavily on them and lose their connection with the audience. If you use note cards, just include brief bullet points. Act confident. Speak with conviction and act confident even if you don’t feel that way. Your emotions will eventually catch up with how you're presenting. Maintain sincere eye contact with different members of the audience. If you're in a large room, it can help to break the room up into sections and direct your eyes to these different areas of the room through the presentation. Be flexible with your attention. When giving a presentation, it's normal to lock attention on someone who is providing negative facial feedback. It's also normal to interpret this as an indication that we're not being successful in delivering our message. In truth, we have no idea as to what that individual is responding to. Have a more expansive awareness of the room. Notice people who are also providing positive facial feedback. Be mindful when you start a presentation. People sometimes become overwhelmed when they start a presentation because they feel as though they have so much to get through. Focus your attention on the present and effectively delivering your message for each part of your presentation. Plan ahead. If there is a possibility that you could be short on time, plan ahead what can be cut out. Also, decide in advance how you can respond to questions that may be asked, especially questions that you don't know how to answer. Be familiar with your location. If you're unfamiliar with where you are giving a presentation, try to arrive early to get a lay of the land. The more familiar you are with the location, the less unprepared you will feel. Practice self-care. Eat well that day. Get enough sleep the night before. And, again, limit caffeine. Public speaking fears can be difficult to overcome, especially if you have PTSD. Therefore, don't expect these tips to bring about an immediate reduction in your anxiety. They require repeated practice. It may also be useful to start out with short presentations in front of people you feel comfortable with. Try to practice these tips when you feel less anxious. That way, you can become more comfortable with using them. Although you may not get relief immediately, with repeated practice and exposure to public speaking, your fears can be overcome.